The light emitted by this laser, (810nm), is absorbed by the pigment of the hair follicle and the hair shaft and causes thermal damage to the follicle. The result is a delayed regrowth of the hair and permanent destruction of many of the follicles. There are three phases of hair growth; active, regressive, and resting. Because the LightSheer treats the hairs that are in an active growth phase, more than one treatment will be needed to disable hair that subsequently enter this growth phase. Generally 3-6 treatments are needed to benefit fully from the procedure. Most see a 70-80% reduction after 4-5 treatments. The hair that does grow back will be finer and lighter in nature. There may be a stinging or tingling sensation during the treatment. There will be immediate redness and swelling in the area, which will subside shortly after treatment. Some may notice redness and slight scabbing for up to one week. 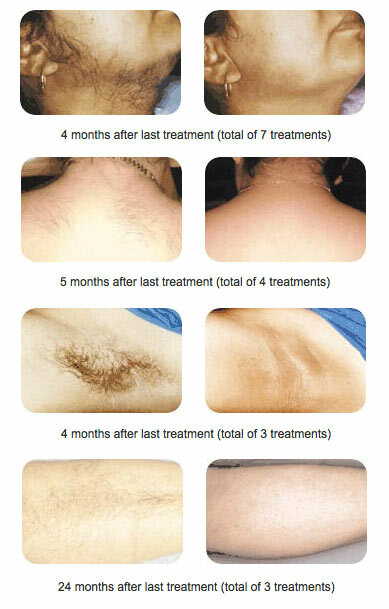 Within one week it may seem that the hair is regrowing, but actually, most of these are hairs that will be shed. Do not pluck or wax between treatments but shaving is allowable. Ideally, the hair should be dark and the skin should be light. Dark hair absorbs more of the laser pulse and light skin responds best to the laser. Blonde and grey hairs respond least to our laser system.